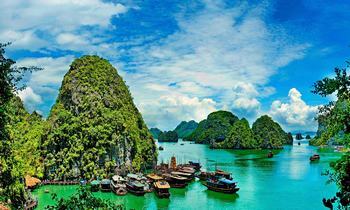 Halong Bay is a famous destination in Vietnam. It has many weird rock structures and forms which are so interesting for the tourists who come here. But not many know the exact location of Halong Bay and many other characteristics that relate to it. Below are the facts about the geographic location as well as many other geomorphology facts. Where is Halong Bay located? Located in the Northeast of Vietnam, Halong Bay belongs to the Gulf of Tonkin, being a part of Cam Pha Town, Halong City. It is right next to Cat Ba Island. The coast is about 120 km long. The bay covers a total area of 1553 square meters with 1969 large and small islands, of which 50% is named, and the rest is unnamed. Within the World Heritage Site, there are about 775 islands, which is shaped like the three peaks of a triangle, including Cong Tay Island, Ba Ham Lake, and Dau Go Island. Halong Bay is a unique site in Vietnam because the process of forming and developing geomorphology is clear here. The place is also the home of Ancient Vietnamese people. Thousands of island are gathered here, making this place a beautiful piece of work made by nature. The biodiversity in Halong Bay is also extremely high and varied. Many of the places have historical values, based on the legends and historical facts of the past. 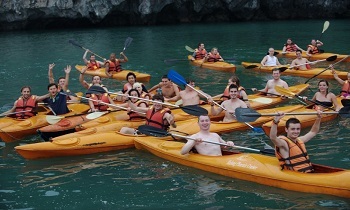 Halong Bay is known for its large caves and stunning rock formations. There is two type of islands in Halong Bay: limestone and shale stone. 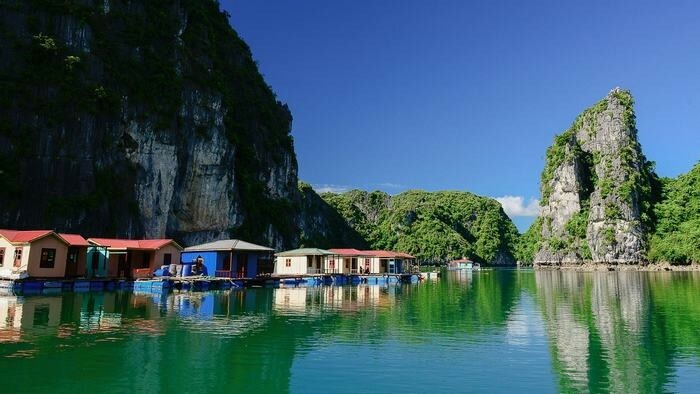 Both are mainly in Bai Tu Long Bay and the south-west of Halong Bay. Geologically, Halong Bay has existed for 250- 280 million years. Many wonders in Halong Bay are the result of the continent moving up and down throughout the years, becoming the sea and land continuously. The Cartxo Erosion is the reason for many beautiful rock formations here in Halong Bay. 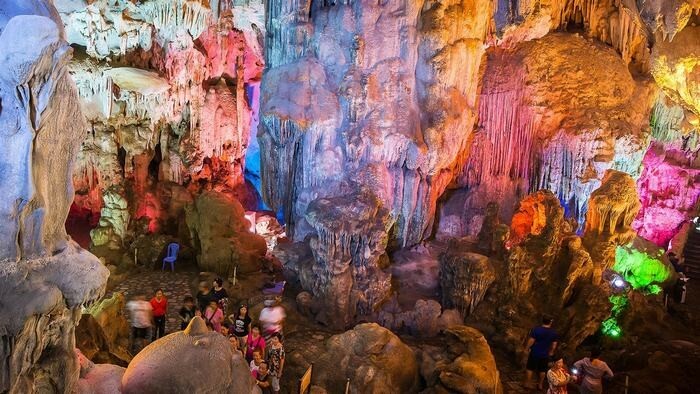 There are also thousands of island formed hidden within these rock islands are the beautiful caves that are related to many Vietnamese myth and legends such as Tam Cung Cave, Thien Cung Cave, and Trinh Nu Cave. This place is like the castle in the world of creation. In the past, people called Halong Bay "the wonder of land in the sky". The geological history of Halong Bay has two main factors: tectonic history and geomorphology. Basic characteristics of Halong Bay for the past 1000 years are the open sea expansion of the bay, extreme erosion, more gulf water, saline, and coral growth. The corrosive process of active seawater creates deep vines that enhance the unique beauty of the Carpathian Strata. Halong Bay is the result of long-term geological evolution. Halong is not only a wonder of the world but also a geological museum that is preserved for 300 million years. These caves are the living proof of the erosion of sea level through geologic time. 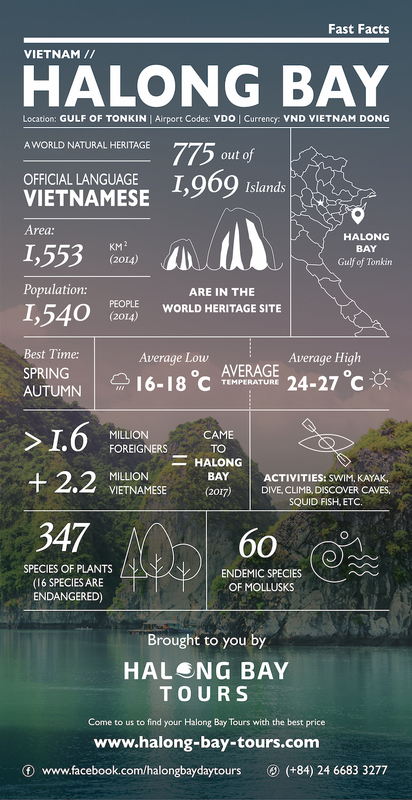 Halong Bay's geological environment is also a cornerstone of other values such as biodiversity, archaeological culture, and other human values and tropical forest ecosystem. So far preliminary assessment of flora in Halong Bay is about 347 species, plants that are divided into 232 general and 95 families. Sixteen species in that is listed as endangered species. 95 species are medicinal plants, 37 species are ornamental plants, 13 species are fruit trees, 10 belongs to the group of different usages. The islands in Halong Bay are home to many mollusks, which makes their home in the rocky niches, and there are up to 60 endemic species. The main kind of seafood that is cultivated in Halong Bay including abalone, sea cucumber, peanut, shrimp, fish, squid (squid, cuttlefish), octopus, and oysters. Halong Bay is an ancient wonder of the world and Vietnam. 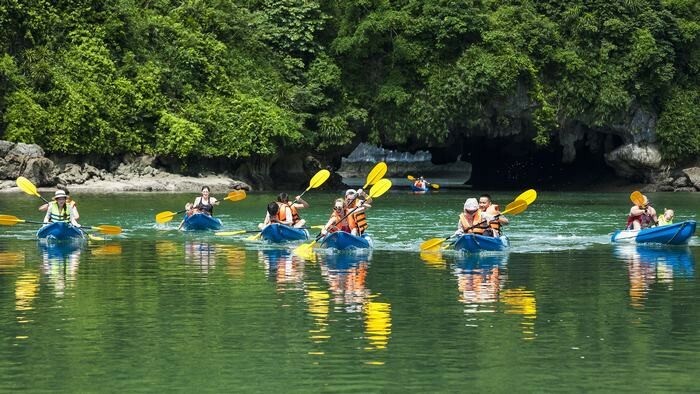 Coming to Halong Bay, you are experiencing a thousand years of culture and geological beauty. It is easily the place to be in Vietnam and maybe Asia right now. 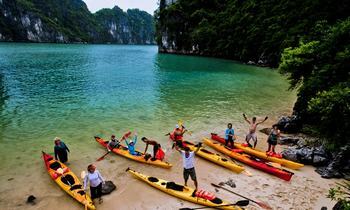 Halong Bay has a temperate climate which is suitable to visit at any time of the year. Each season has its own beauty. Coming here in summer, tourists will be delighted on a lot of interesting activities such as swimming, diving or kayaking, In winter, you can see the faded scenery of the bay. The peak season of international tourists is from October to April whereas domestic visitors often come here in summer, from May to September. July and August is the storm season, so you should not travel to Halong Bay at that time. 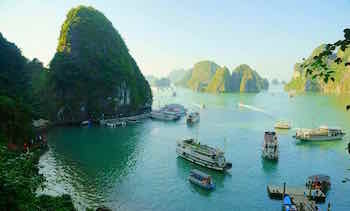 Q: How long does it take to travel from Hanoi to Halong Bay? 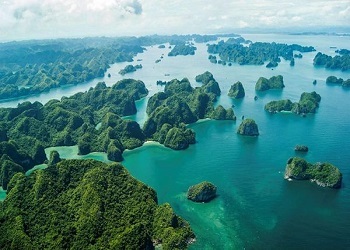 A: It's about 175 kilometers from Hanoi to Halong Bay. 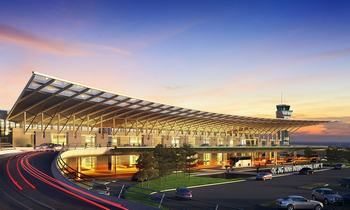 It will take around 4 hours to travel by shuttle bus and 3.5 hours by private car. 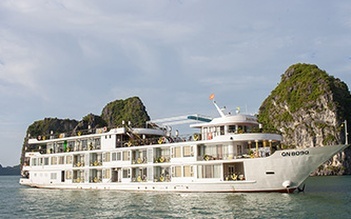 Q: Should I stay one night or two nights in Halong Bay? A: It depends on your budget and your time. If you have enough time and can afford the longer option, the 2-night cruise is the better choice of which you can explore the bay further. Q: What do we need to pack with when coming here? A: Whenever traveling, it's highly advised to carry insect repellent, hand sanitizer, aspirin/paracetamol, medicines for stomach troubles, etc. And don't forget to bring your original passport, swimming suits, sunglasses, cash or credit card, etc. Q: Do we have to bring a passport for a sleeping board? A: Yes. 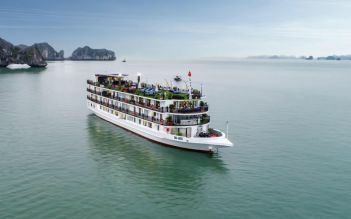 You have to bring your passport with you on the boat and please provide us your full names, gender, passport number, visa expiry date before your departure to Halong Bay. A: You are recommended to bring: sunglasses, sunblock, wide brim hat, insect repellents, swimming suites (in summer) or warm clothes (in winter) and original passport. Q: Some activities that we can take part in within a cruise program? A: Activities you can take part in during within a cruise program is: Movie Night, Board Games, visiting the Floating village, go fishing, cooking class, kayaking or swimming, biking, climbing… It depends on each cruise and the length of the cruise program as 02 days or 03 days. Please see more details on cruise itineraries. Q: What time does shuttle bus pick up/ drop off guests in Hanoi? A: That depends on each cruise, the time may be different. Normally, the shuttle bus will pick you up at your hotel in Hanoi Old Quarter around 8:00 am to 8:30 am and drop you off around 16:00 pm to 16:30 pm in Hanoi. Q: Are there choices for vegetarians or anyone who does not eat seafood on cruises? A: Yes, with special requests on food (diet or vegetarian), please inform us before departure. We will offer and arrange other foods for you. 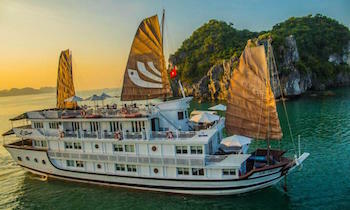 In it undeniable that Halong Bay would be an ideal destination for your holiday thanks to its stunning scenery and interesting activities it offers. What else are you looking for? 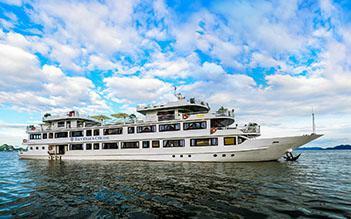 Let's take a Halong Bay cruise tour and explore yourself why Halong Bay is so attractive. Please let us know if you have any questions and need further information via our website. If you find this article helpful, you can share with others. Thank you! NAVIGATE Where is Halong Bay Vietnam located on the map?